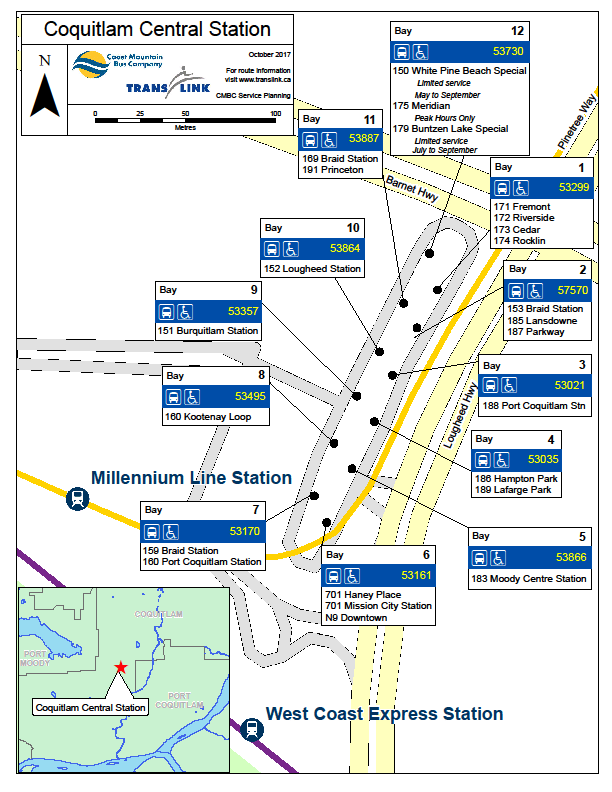 The Buzzer blog » Coquitlam Central Station bus bays are on the move! Coquitlam Central Station bus bays are on the move! Heads up Coquitlam Central Station bus users, come October 30, 2017, your bus bay may be moving to make catching your bus a little easier. If you catch a bus at Bay 1, 2, or 4, or ride any of the following bus routes: 153, 171, 172, 173, 174, 185, 186, 187 or 189, on October 30, 2017 you’ll be tapping in from a different bay. Not sure where to go? We’re here to help! Look for signage at the bus exchange, tweet us @TransLink or call 604.953.3333. Bus 152 stop between Mundy and Hickey needs to move their stop to be in line with path leading to next 2 streets. Plus there needs to be a designated cross walk with lights there. We constantly watch people trying to make it to bus or disembarking and taking their lives in hand trying to run across busy Austin Ave. Especially freightening for chikdren and seniors.